When I would work my hive, I would occasionally get minor cuts on my fingers and knuckles. At first, I thought nothing much of it. I don't normally wear gloves and I just figured I nicked myself with the hive tool or something of the sorts. The cuts were not bad and were actually more like paper cuts. Except they would sting or tingle - sometimes for days depending on where it was on my hand. Normally no bleeding would result, unless I squeezed it hard. This has happened to me more often than actually getting stung. The last time it happened I knew exactly what it was. I did something stupid and got bit. 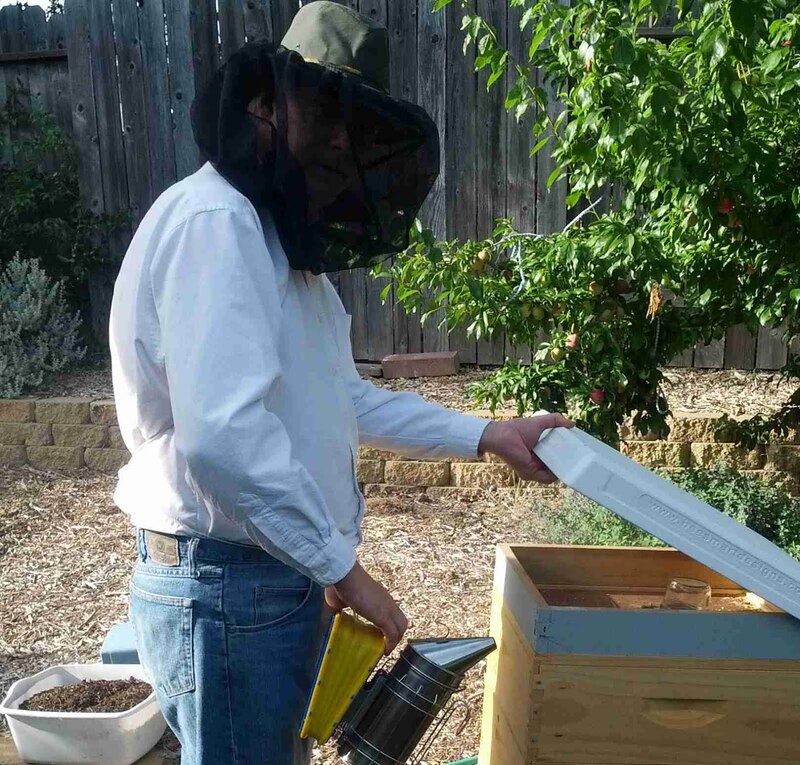 This is the first year that I have been a beekeeper. I have wanted to keep bees for years. Before getting them, I had attended classes, seminars and did much reading on the subject as well as watch videos. One thing I have not heard anyone talk about is the fact that bees can also bite (people). The day the light bulb came on above my head. It happened when I was preparing the hive for a relocation. The night before I blocked the entrance so they would not start their day (normally 5:30 AM) What I wanted to do next was to put pollen patties under the inner cover before strapping it all down. One thing I wasn't aware of is the inner cover is asymmetrical and can be flipped around to allow more room between it and the top frames. This morning I saw no need to suit up or even light a smoker. It was quite as they were all inside. I thought this would be a quick easy job. I first removed the lid and 'feeder ring'. I then slowly lifted the inner cover and pushed the calm bees aside and laid down the patty successfully. I lowered the inner cover down and I was going to strap it in place with tie downs (without the plastic lid). As I started to press down firmly to seat it to begin to ratchet the straps, I heard that unpleasant sound of crunching bees. I knew I had to finish the job quickly because now there is alarm pheromones that will make them aggressive. When I released my pressure to readjust the misaligned inner cover, it flexed back up 1/4 inch - the thickness of the pollen patties would not allow it to sit flat and flush. As soon as that happened some guard bees stuck their heads out the crack and looked around - as if to say 'what the hell?! I reached for the inner cover to adjust it straight. That's when I flinched back and said 'what the hell?!'. Yup, I got my middle finger 'cut' or should I say bit. Right on the tip of my left hand middle finger. That location was the most painful and I fully expected to have to pull a stinger out. I stood there staring at my finger feeling the pain but seeing no stinger. I had to blink a bunch of times to keep staring, thinking why is my finger hurting when I see nothing. I went ahead and squeezed it and very little blood came out, but I knew it was a cut. I darted back in the house (15ft) while being randomly dived-bombed by bees. I quickly washed hands, through on a vail and went back to finish the job. As I understand it, from posted research journals '2-Heptanone' is found to be excreted by honey bees when they bite small pests within the colony such as wax moth larvae and Varroa mites. It acts as an anaesthetic on the pests, enabling the honey bee to stun the pest and eject it from the hive. It was kinda freaky but it took 3 days before the tip of my finger started to feel normal. It was numb/tingly/sore. Not too bad, but it was a constant reminder every time I had to use it to release the safety belt when exiting the truck. Well, this was the last dance - The next morning I transported the girls to their new foster home. This will be temporary. We are looking for their new home still. This is the first time I saw my honey bees dance all in unison. This is what they call wash-boarding, and experts are still not sure why they do this, and where the music comes from. It's been observed that the bees that participate in this activity are mostly workers between the age of 15 and 25 days. Mostly at the end of a nectar flow. It's unknown if this is general cleaning activities. Studies show that this happens more often on coarse textured surfaces than smooth. My observation is that it happens more in the (hot) evenings.